A classic Grey's Anatomy clip from Season 2, in the episode "Thanks For the Memories." Derek comforts Meredith as she reacts to a patient's condition and her own mother's fate. The song playing is "Scratch" by Kendall Payne. Seriously. Meredith and Izzie are spurned by the respective objects of their affections, and turn to George, who just wishes he could go to sleep. 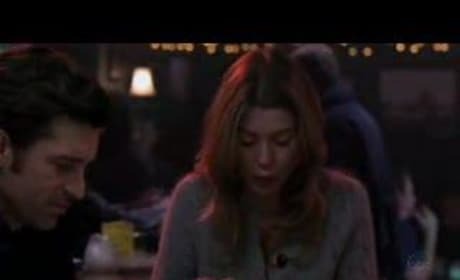 At the beginning of "Name of the Game" (Season 2) Meredith swears off men and booze. While at the bar. Derek and Addison react awkwardly.